The winner of the St. Lawrence Market North Building architectural competition is Adamson Associates Architects and Rogers Stirk Harbour + Partners, also known as the "red team." 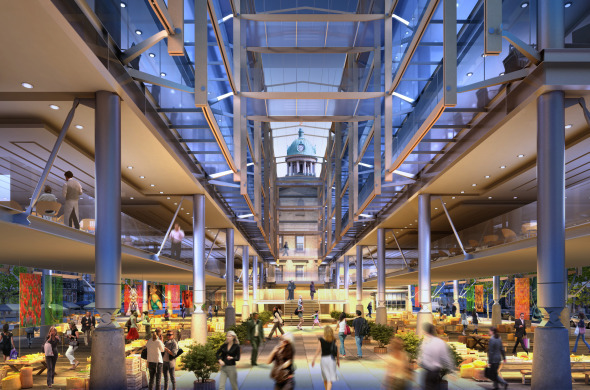 The team was one of five short-listed in February for the competition to design a new North Building in the St. Lawrence Market Complex. 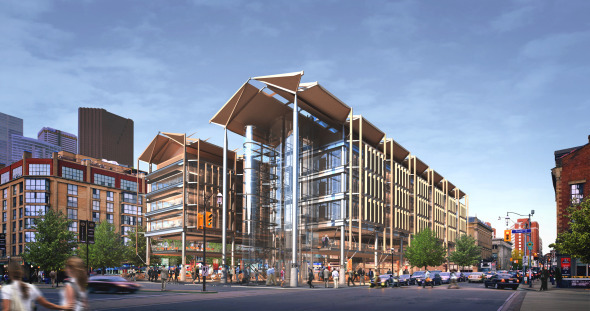 Their concept involves creating a five-storey atrium to allow for natural light and ventilation, and a covered street to connect the North and South markets. All in all, looks pretty great. 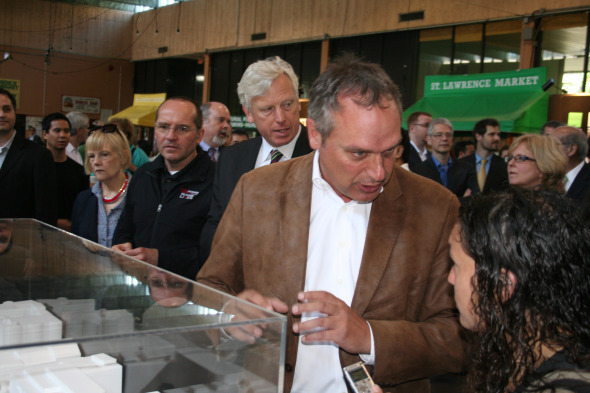 According to Peter Berton, the professional advisor to the design competition, the seven person jury spent two days debating the decision. They finally "unanimously" agreed on the winning design. This is interesting considering the jury included a wide range of people from Christine Couvelier, an expert on food market design, William Greer, a former chief architect at the Toronto Historical Board (now Heritage Toronto) and Russell Smith, an author and columnist for the Globe. Lloyd's Building in London. 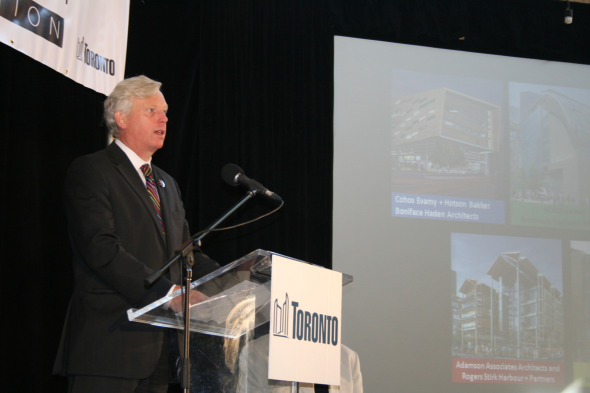 This will be the first Rogers' building in Toronto. The design competition generated a lot of interest from the community. Over 1,000 comments were submitted to the jury from concerned citizens, many of which were passionate and well-thought out. 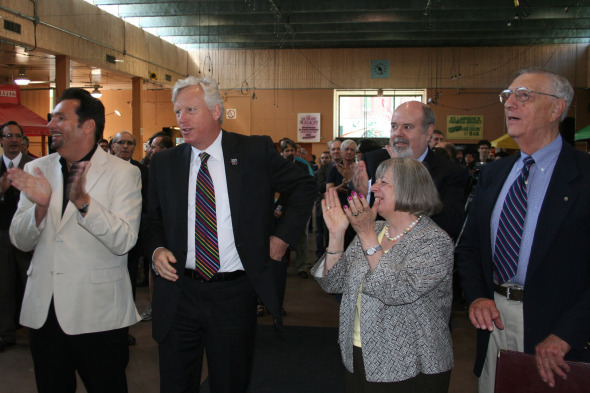 As Pam McConnell reiterated throughout the presentation, St Lawrence Market is one of the city's "special places" and ensuring it works well is a huge priority for many members of the community. With such high levels of emotion about the project, there has already been some controversy. In a no-holds-barred editorial in the Bulletin ("Downtown Toronto's Best Read Community Newspaper"), the author Frank Touby claims that by holding an international competition, the city essentially voided all of the community's concerns about the new building. And the winning building's very modern-looking steel and glass exterior will likely cause concerns it does not "respect" the neighbourhood's architectural character. When this new building is finally completed in 2014, it will have been over fifteen years since the redevelopment process began in 1998. For those who still want to enjoy its bounty, the North Market's farmer's market will continue during the building's construction at 125 Esplanade.